Curly maple and cherry headboard with Mother-of-pearl, gold abalone and rosewood details. Hand carved cherry pine cones. Other inlay patterns available i.e. fish, geometrics, etc. 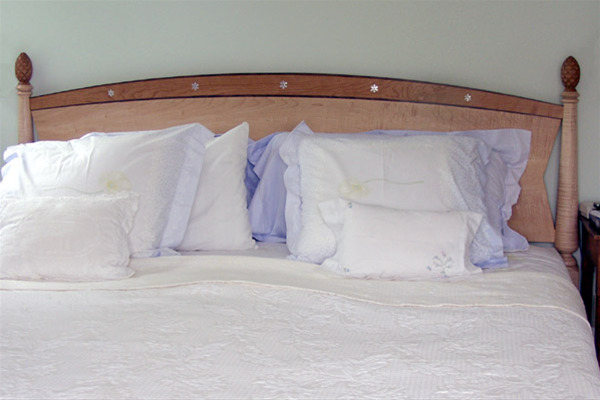 Price shown is for the five snowflake inlays in a queen size headboard. For a king headboard, add $250., For additional inlays as shown in the small bottom photo, add $75. per inlay. For custom quotes and drawings for other inlay designs, feel free to call or email.